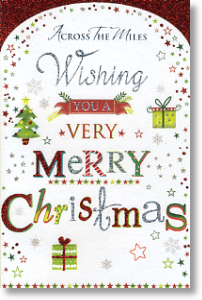 Festive and cheerful contemporary 'Across the Miles' Christmas card with plenty of Christmas bling! Send your Christmas best wishes to loved ones far away to let them know you're thinking of them. The front design has silver foil writing and a generous helping of red glitter detail! Inside the card has a full colour print.